It's been a long time coming now but Fullerton can now finally say that it has the tavern with biggest selection of small-batch whiskeys in Orange County (count them - 105!). 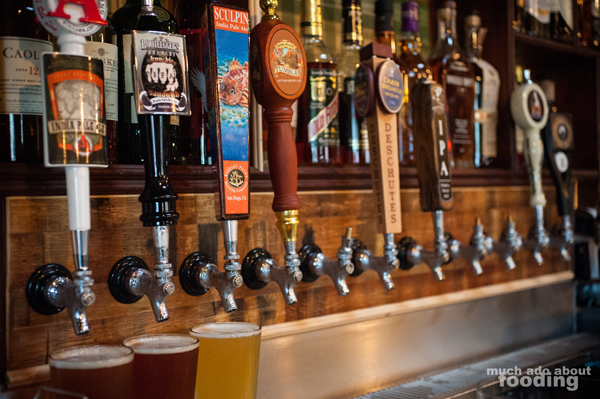 Hopscotch Tavern opens today to its happy crowd of supporters and an eager community. Prior to their opening, I got the scoop on the place after having a phone interview with co-owner Bryan Gonzalez who had crafted the idea towards the end of 2009. After jumping through many hoops and getting all the pieces in place, I think he and partner Rob Marshall are so glad to finally open Hopscotch's doors. So what is this place? I started off trying to get a sense of what the original concept was for this tavern. Bryan: I've always had a love for craft beer. I started to fall in love with whiskey and the idea of a whiskey bar just from going to urban areas. There's a place in LA called Seven Grand and I fell in love with that place. 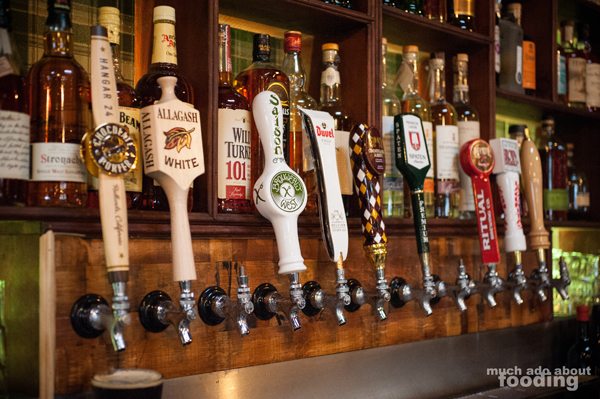 Their concept is basically whiskey bar with craft beer; we're more of a craft beer bar with whiskey. I think it's something that is classic that was done for a long time that just died off. You know the whole margarita world, and then the vodka, and now everything's just going back to the brown spirits. There's something to be said about this harkening back to the classic liquors, and the community that is coming up through the woodwork to support this really shows the hidden interests of people. 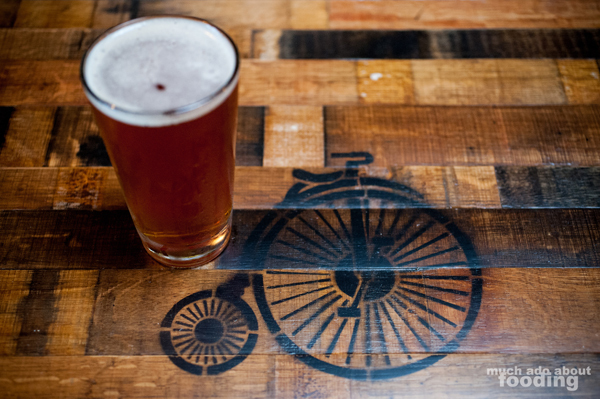 The entire one-of-a-kind bar is made from the wood of old whiskey barrels. Considering how long it took for Hopscotch to finally be erected, it comes as no surprise that the original name for the place has changed. 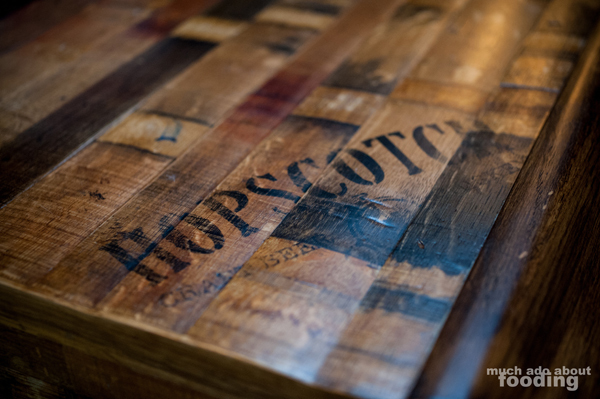 The name "Hopscotch" just happened to be a happy and accidental play on words as Bryan tried to combine both his hophead-ness and his appreciation of scotch. After Rob denied Bryan's initial idea of "Hop House" because it didn't say anything about the whiskey, the name popped to mind to combine the two interests and by coincidence, it also became a name which women liked as it brings up association with the playground game. I did tour the place while it was in its finishing stages of construction and snagged some shots of it. 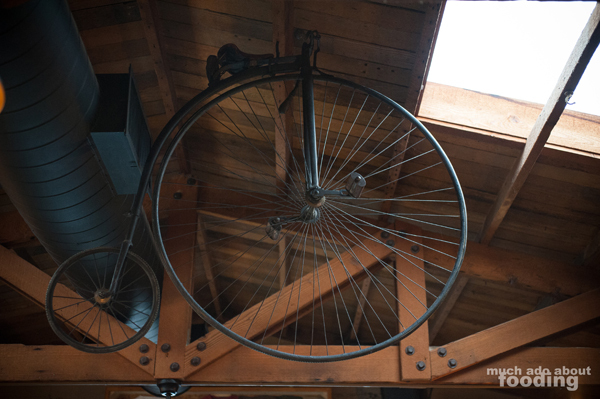 For those of you who don't know, Hopscotch is actually housed in the original Pacific Railway Station which was built in 1918. 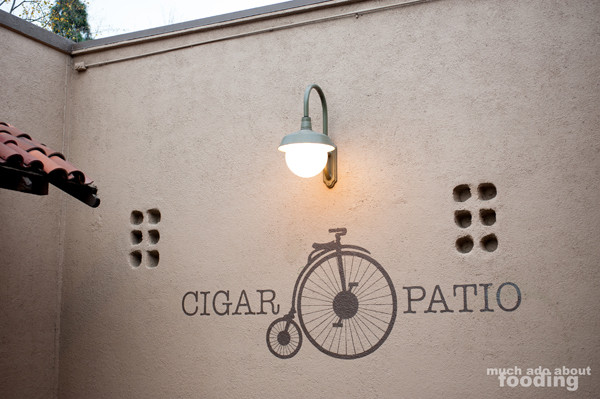 I wanted to get a little more insight on the place which not only has gone through many changes of space usage (for example, a cigar patio!) but also kept some of its unique characteristics. So the space, how did you come about finding it? Bryan: I'd always loved this location and it wasn't something that was for sale at the time. Through a wine vendor that was a friend of the previous owner, I asked to mention to him to see if he was interested in selling the place and I literally got a phone call the same day after I told her. It was kind of just a shot in the wind and he called me back, and I was like, "Are you interested in selling?" and he was like, "Yeah, yesterday." So we kind of jumped on it and got the ball rolling. I saw that it was listed as a haunted building. Bryan: Yeah you know the only thing that I've experienced was nothing I saw but something I felt. I was standing by the bar and it was really hot in the building because we hadn't started up the AC yet and there was just an area that I had just brushed my arm through. It was really cold, not just like a breeze, but it almost felt like an air conditioner blowing but there wasn't one in the area. So at one point, I called Joey over (Joey's one of the contractors), and I'm like, "Hey Joey, come feel over here." And he put his hand in too and he was blown away. It kind of freaked us out where we both got goosebumps and then it went away. I know one of my partners, Rob, heard a weird noise behind him when nobody was in the building. Joey heard something weird when he was in the restroom. But I think that it goes along with the fact that it's a really old building, I mean it's from 1918 and it wasn't like a small business. It had many people traveling through because it was the Pacific Electric Railway station. I mean, thousands upon thousands of people traveled through this place and I had one other thing that happened. Before I got the keys to the building, I walked over with a friend of mine and he looked in the window and he jumped back. I could tell that something had happened so I asked him. He said, "Oh nothing." I said, "Just tell me." He said, "You're going to think I'm weird but ever since I was a little kid, I could see things that other people can't see. When I looked in, I saw a bunch of people in old hats like fedoras and things you'd see in the '20s and they all scattered." And I had read in the book months before that and that was one of the things that people see. So, I haven't experienced anything that severe but obviously I've had a couple people experience that. I kind of just did my thing where I walked around and told them I'm here to make a nice place for them and they are more than welcome to stay as long as they behave. [laughter] I did that on my own and I haven't had anything happen since. I think it's more of a cool thing than scary. Sounds like it's going to draw in some people! 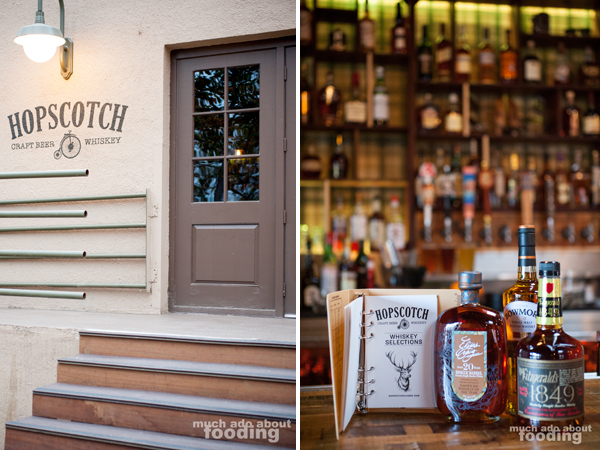 One of the neat experiences that will be available at Hopscotch are the whiskey pairing dinners. I asked Bryan to touch on what inspired the menu, whether it was the drinks or something else. What I learned was the desire to make something not just different but enjoyable on a casual, homey level. 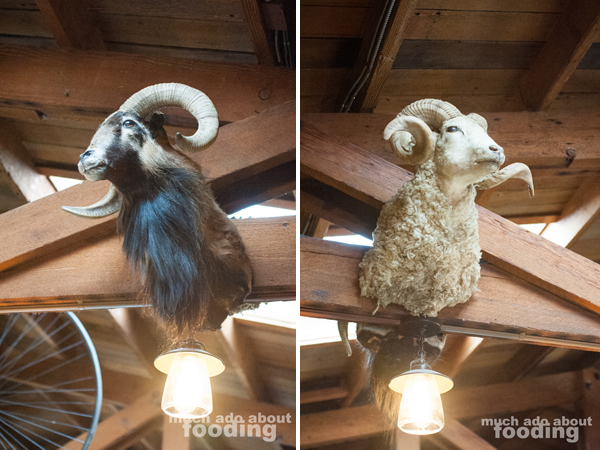 Their food is advertised as "slow cooked food" which means that they will be tender and definite comfort foods. Bryan: "Y'know barbecue's one of those things you tend to eat maybe once a month and I wanted to open a place where you'd come a couple times a week. I just wanted food that was super tender and falls off the bone if it's on a bone. I think that's a concept that some people lose when making barbecue. There isn't really anyone doing that sort of thing right now. We've got the pulled pork, beef, roasted chicken - we're going to slow cook all kinds of things. We've even joked around about slow cooking artichokes and making our own sausages." I didn't get the pleasure of trying out their food just yet but I'm quite excited about it. Executive Chef Kent Pawlowski happened to agree with Bryan himself on all of the proposed menu concepts and threw his own expertise in the loop, coming up with four housemade sauces to add to any sandwich or protein chosen (the four being Asian, sweet and spicy, Carolina mustard, and Southern barbecue sauces). One of their cooking options for guests will also be the "slow and low" meaning that the food has been cooking for several hours (think 20 hours sometimes!). They'll also allow for a la carte and take-out options so that 1/2 lbs. 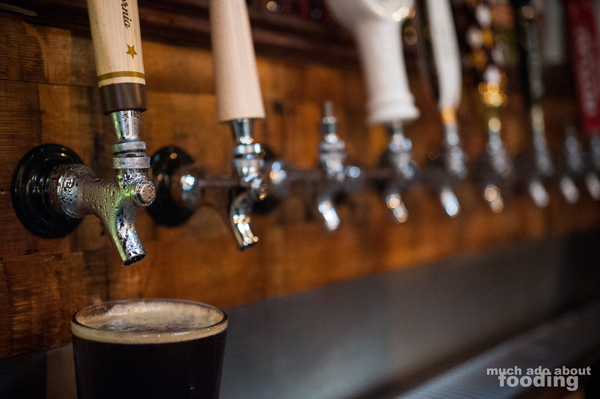 or pints can be ordered to-go. How did you choose which whiskeys to stock? Bryan: One of the places I love going to, Seven Grand, I befriended one of the people there who does all the whiskey trainings. He does the whiskey training and the purchasing in downtown LA and I started picking his brain like, "If you were to open a whiskey bar, what are some of the ones you'd pick?" and we basically broke it down into styles and took those styles to break down into regions. From there, I decided we needed to have at least 100 whiskeys so we did. We have 105 and it's pretty cool to look at all on the shelf. I was curious then as to what a typical night would look like. His vision? An experience to touch all of your senses. Bryan: A lot of people will be eating - we've got a whole separate area downstairs just for dining. You could also dine anywhere you want in the bar upstairs (taller seating upstairs). Downstairs is lower seating like pub height, counter height seating and I'm hoping to see everybody with craft beer in hand and maybe a glass of wine enjoying their pulled pork or sandwiches. We also have our 10oz barrel burgers, a play on a old-style burger called the Juicy Lucy where they would stuff the burger with cheese. We are stuffing our burgers with everything from Bleu cheese to onions. There's at least 5 different styles of the 10oz barrel burger that we're doing. There's going to be a major focus on what type of music is going to be played. Not really going to be playing anything commercial or poppy. We're going to focus on old-school classic rock but not popular stuff that you would have heard but maybe old Stone stuff you've never heard before or old Eagles - just something with a soulful rock beat in the background and not too loud where you can't have conversation or enjoy your dinner, just good enough to where you can actually experience some really good music. Visually, inside it's cool - we've got a chocolate brown, olive green, and a tan. I've stained cement a light light olive green. 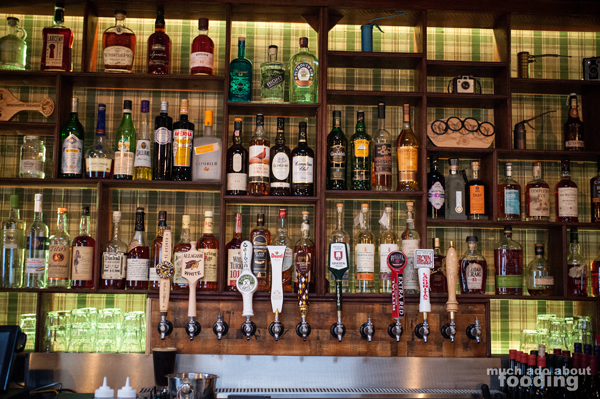 The backbar is plaid with staggered shelves that are backlit. 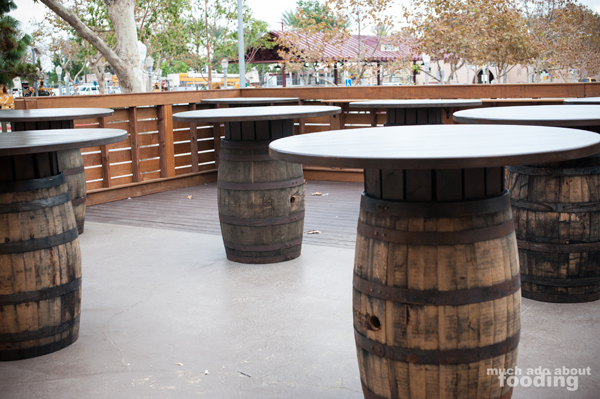 All of our tables are old reclaimed wood stained with a dark, dark stain. All the lighting is with the old-school filament bulbs. 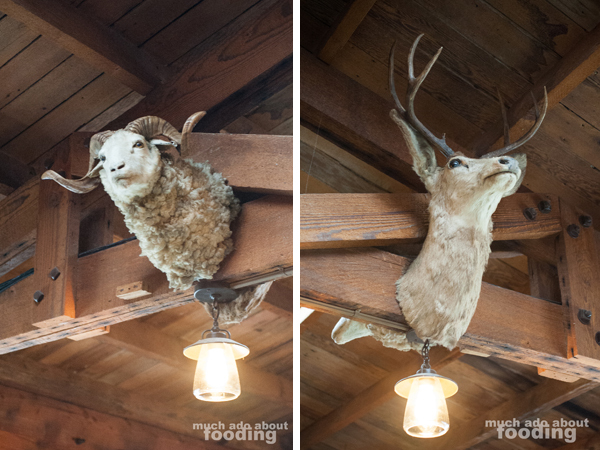 We also have a bit of taxidermy (hopefully that doesn't offend anybody) up in the bar area. 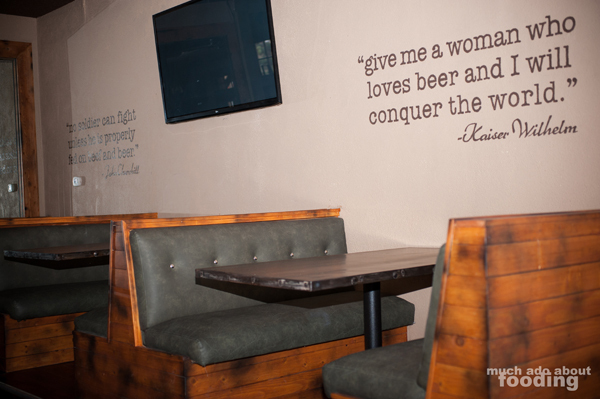 We also have TVs throughout so you could enjoy sporting events. Late night I'm going to play old Western movies. I really liked everything I was hearing and just wanted to know if they had a target demographic. To my pleasant surprise, Bryan said no. His mission is to educate people and introduce them to food and drinks that they have never had before and will fall in love with. Yet how the masses will be educated lies in his philosophy of supporting local brands and small businesses. I love it. I love seeing this recent surge of support for the local community from various places. As Bryan says, "It's all about that now." The reception has been astounding for Hopscotch when they were working towards completion, oftentimes being interrupted during construction by passerbys yelling at them to open up already. The great location, great drink menu as prepared by Director of Libations James Wood (had the pleasure of meeting him during the photoshoot and learned that his history and expertise in the craft beer world will stock Hopscotch with hard-to-find brews), and great food are all the more reason for you to hop right on over with me to grab a drink sometime. What do you say? Thanks to Bryan Gonzalez (Hopscotch) and Rob Hallstrom (714 Media) for their time. Main photography by Duc Duong.